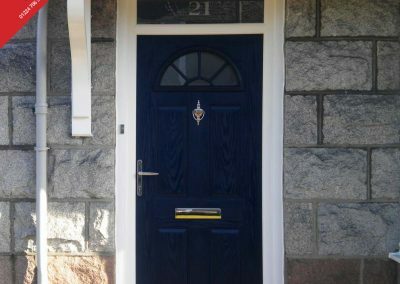 With Thistle Windows & Conservatories you can combine traditional design and modern materials with our VEKA Composite Door collection. 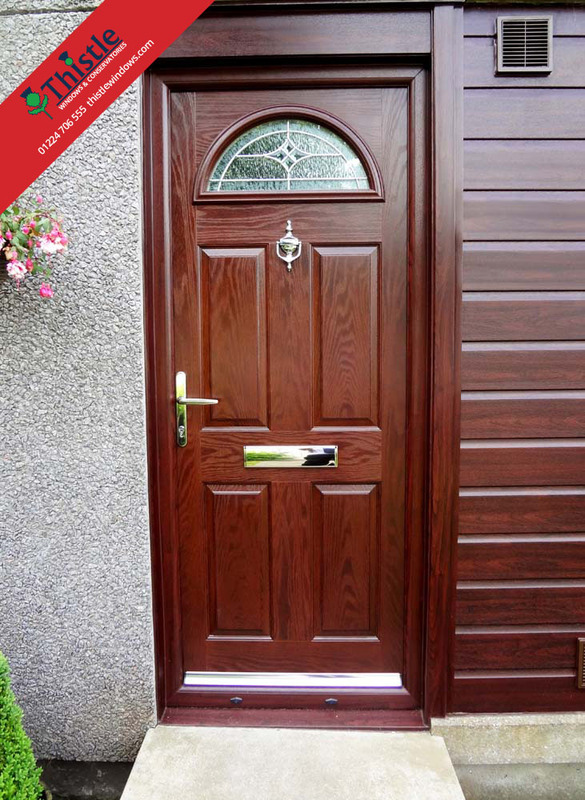 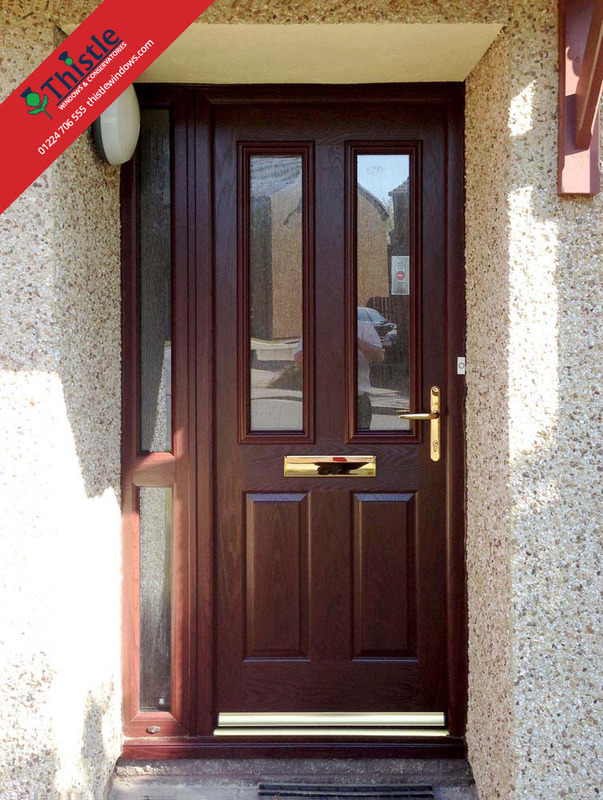 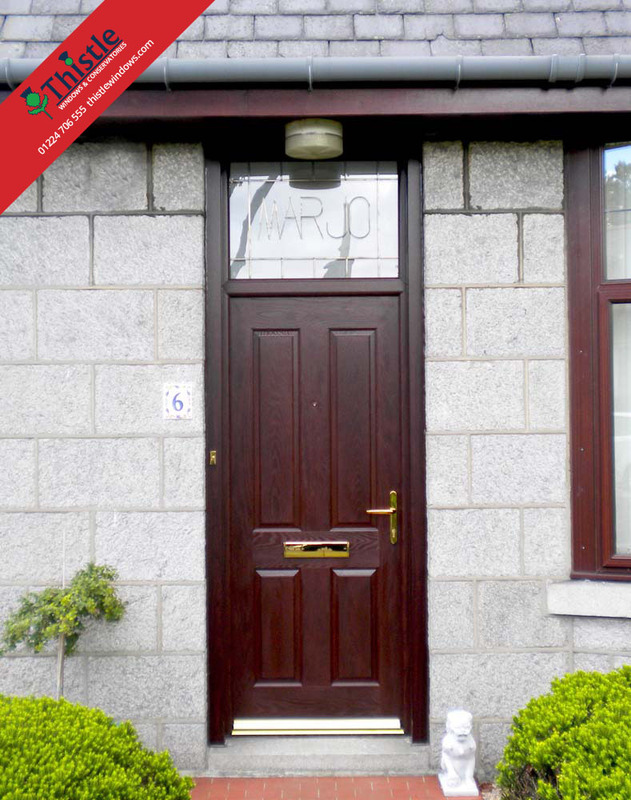 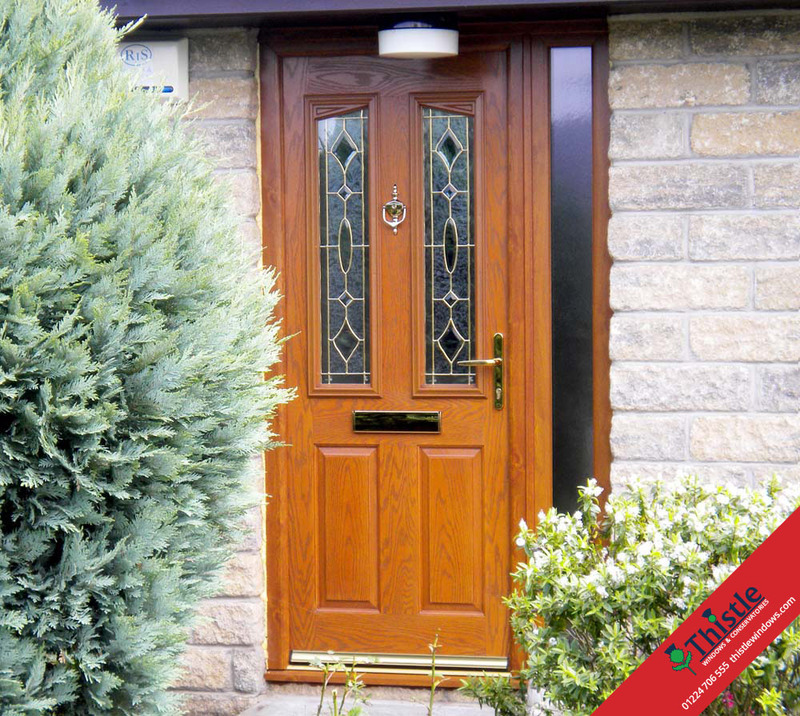 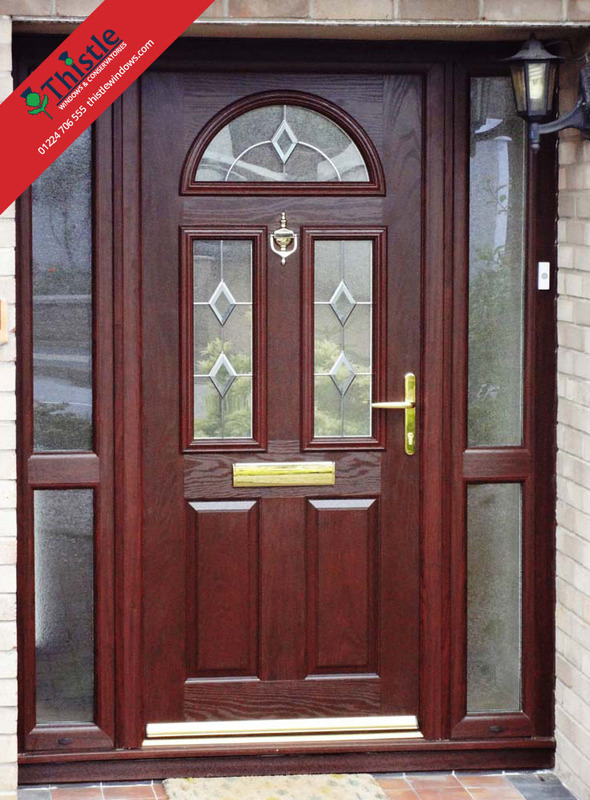 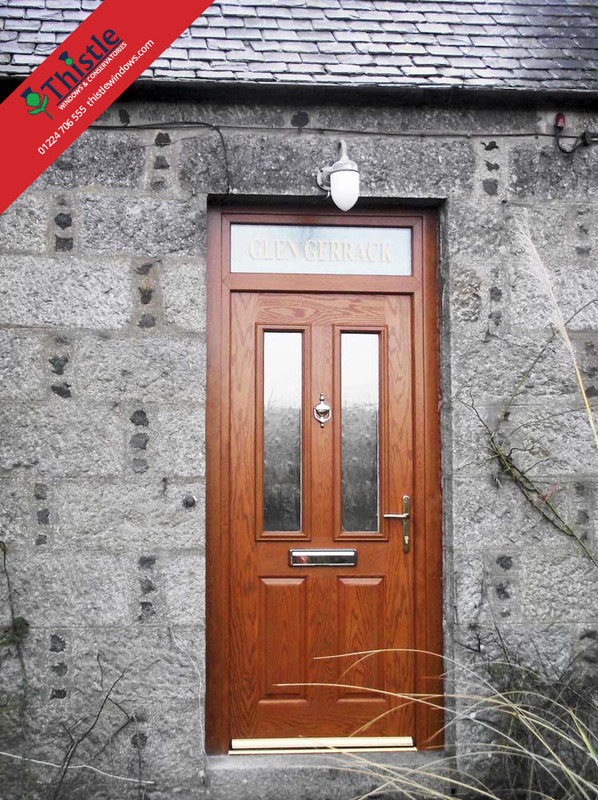 The VEKA composite door offers all the traditional good looks of timber without any of the drawbacks. 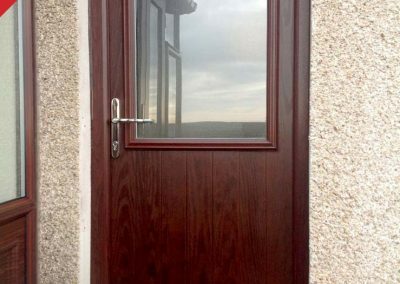 While timber may crack, split or warp and of course, need regular sanding and re-painting, uPVC requires very little maintenance and offers all the security, performance and long-life expectancy of modern materials. 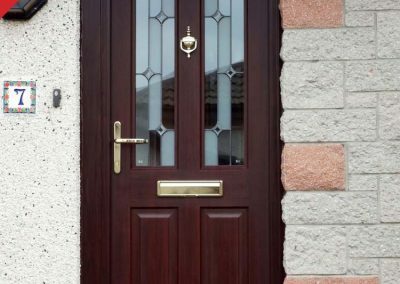 From the door, frame, glass, handles, hardware and mechanism to the actual installation itself – your entire VEKA Composite Door is protected with a comprehensive 10 Year Thistle Windows & Conservatories Guarantee. 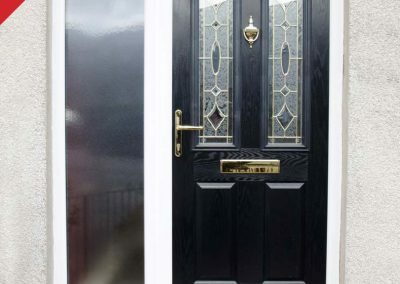 Additionally, for complete peace of mind, all of our Composite Doors are also covered by an additional 10-Year Insurance-Backed Guarantee, provided by national industry standards organisation Independent Network. 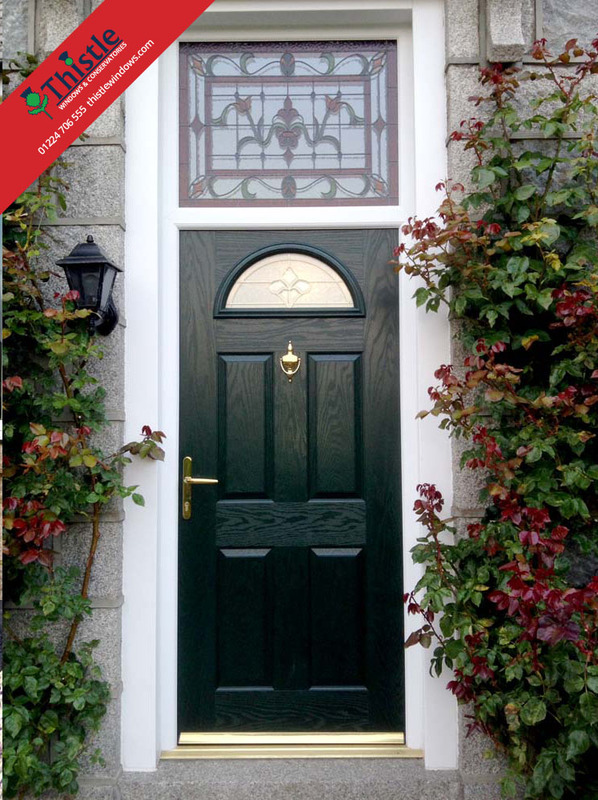 Our VEKA Composite Door collection features a choice of over 30 door styles, numerous glazing options and 8 external colours (White, Blue, Red, Green, Black, Rosewood, Golden Oak and Grey) – including 2 woodgrains. 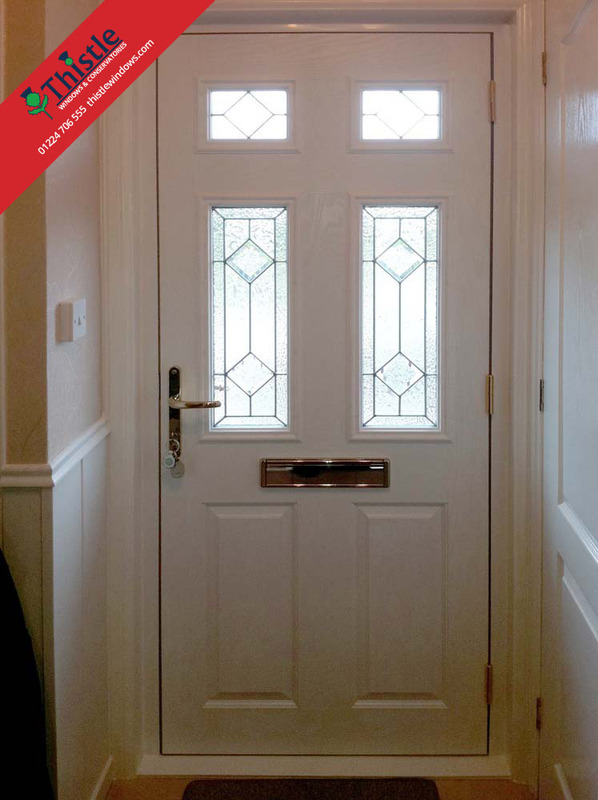 Doors with a white internal colour are supplied with a white grained effect edgeband to give that realistic finish. 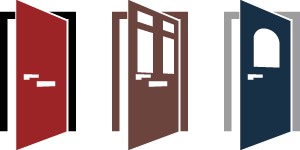 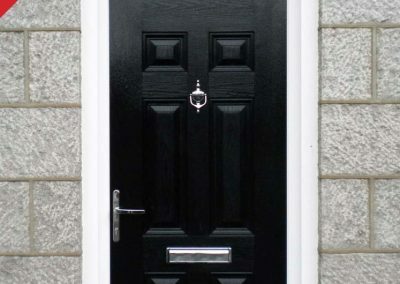 Choose your door frame in maintenance-free uPVC and select from White, Rosewood, Golden Oak, Black or Grey. 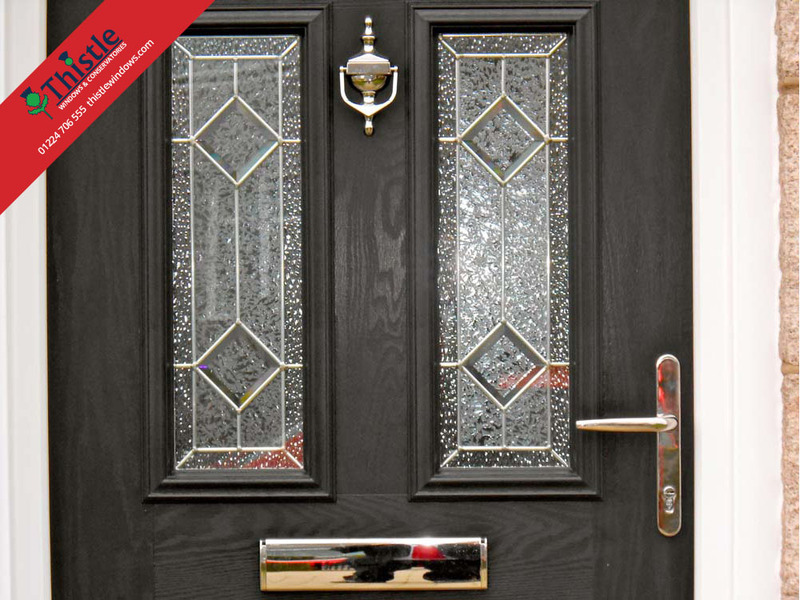 Choose from a range of hardware options and finishes with handles, letterboxes and door knockers available in White, Bright Chrome, Satin Chrome, Bright Bronze, Hardex Graphite, Hardex Gold, Black and Antique Black. 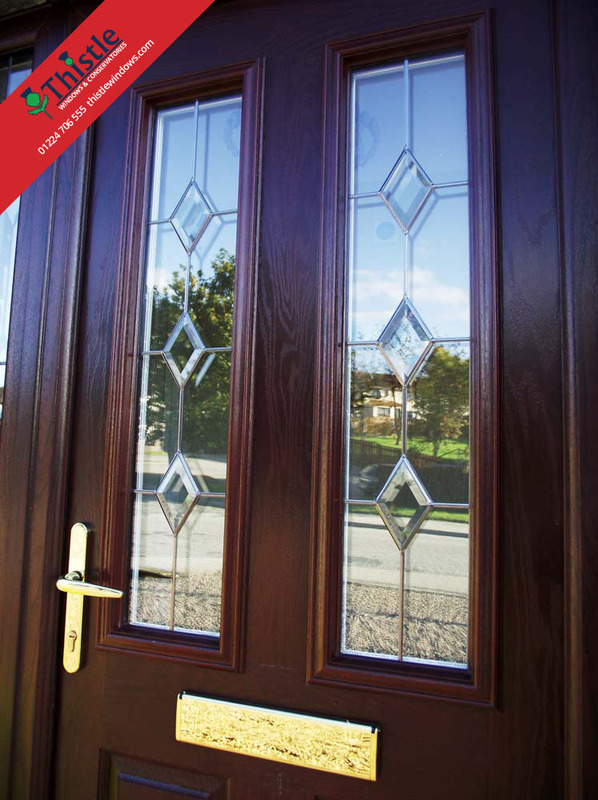 Give your VEKA composite door even more individuality with our choice of glazing panels. 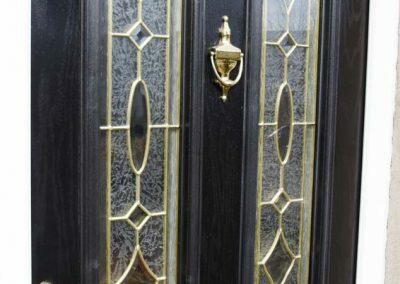 Select from wide array of glass designs and production techniques to create a stylish option for your home, from conventional coloured glass to textured glass and elaborate Art Deco bevels. 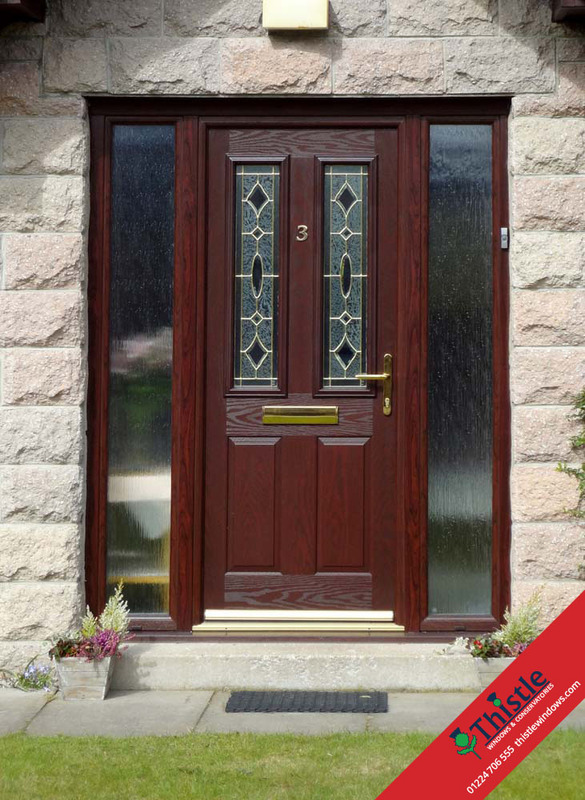 You also have the option to complement your VEKA composite door with side panels, available with or without glazing. 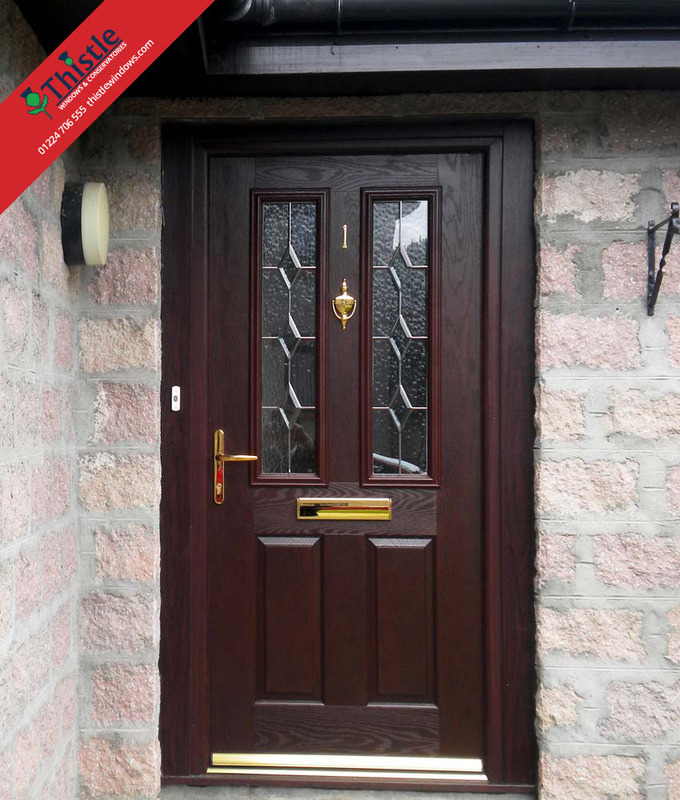 The tough GRP surface of our Composite Doors is highly scratch-resistant and will help it keep that “new look” finish throughout its long life. 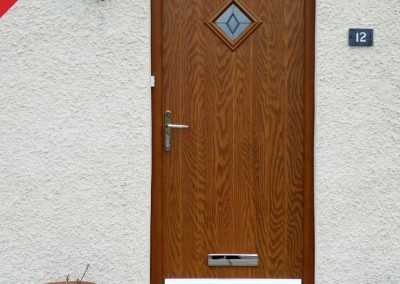 This is mounted onto a composite material sub-frame, supported by laminated timber stiffeners and pressure filled with energy-efficient foam. 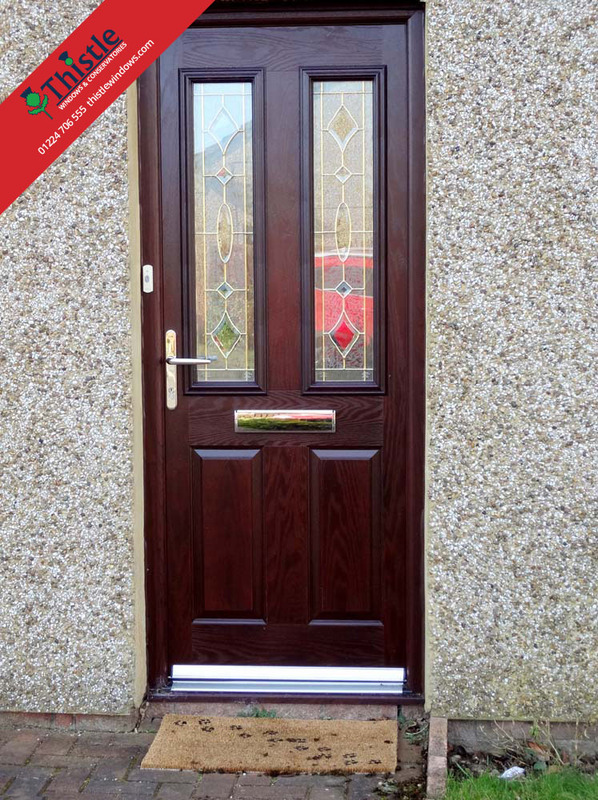 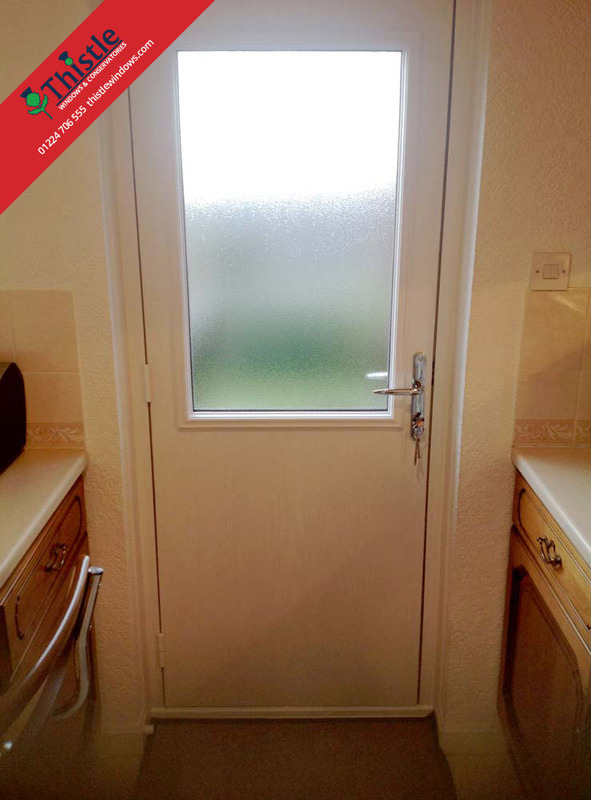 The outer edge of the door is protected with a hard wearing uPVC strip that provides a neat and durable finish. 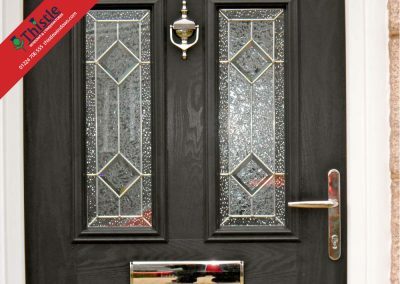 You will find Ultion™ Sold Secure Diamond Locks fitted as standard on all VEKA Composite Doors from Thistle Windows & Conservatories. 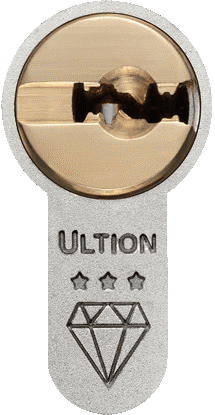 Ultion locks have been drill, pick, bump and snap tested and have received Diamond Certification from the Master Locksmith Association. 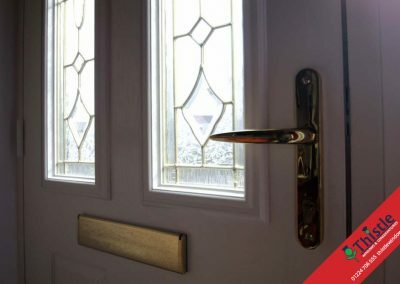 Ultion locks are still snap secure even if a key is present in the inside of the lock, making them one of the most secure lock systems on the market today. 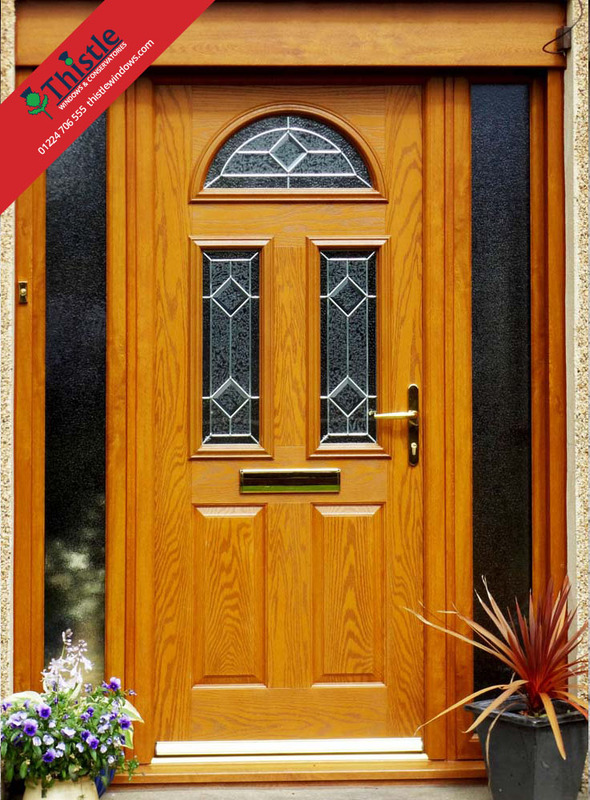 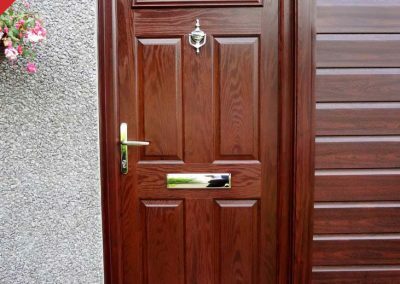 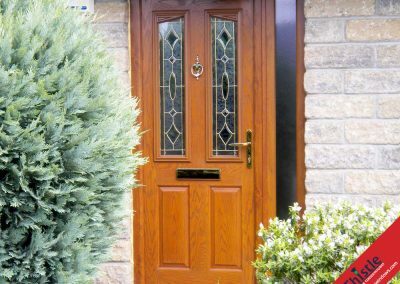 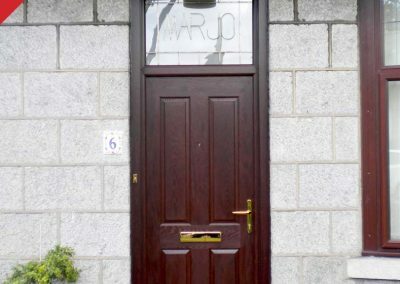 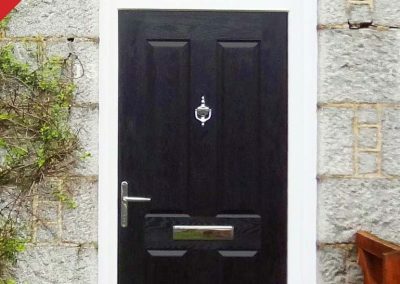 What are the benefits of a Composite Door vs. a Timber Door? 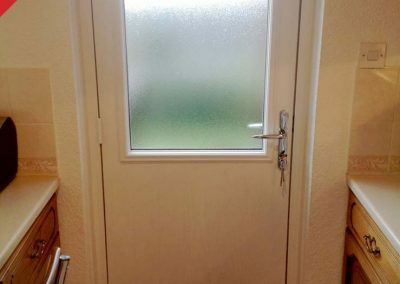 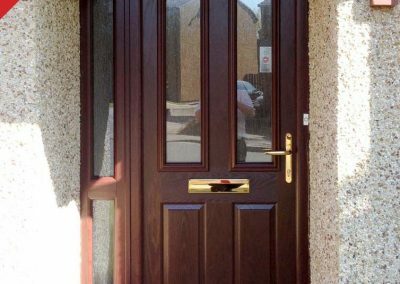 How secure are Thistle Composite Doors? 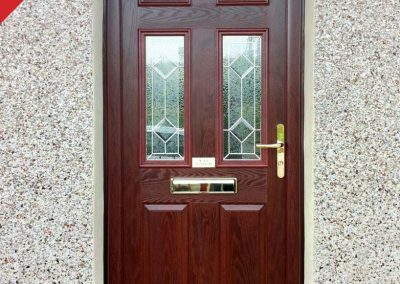 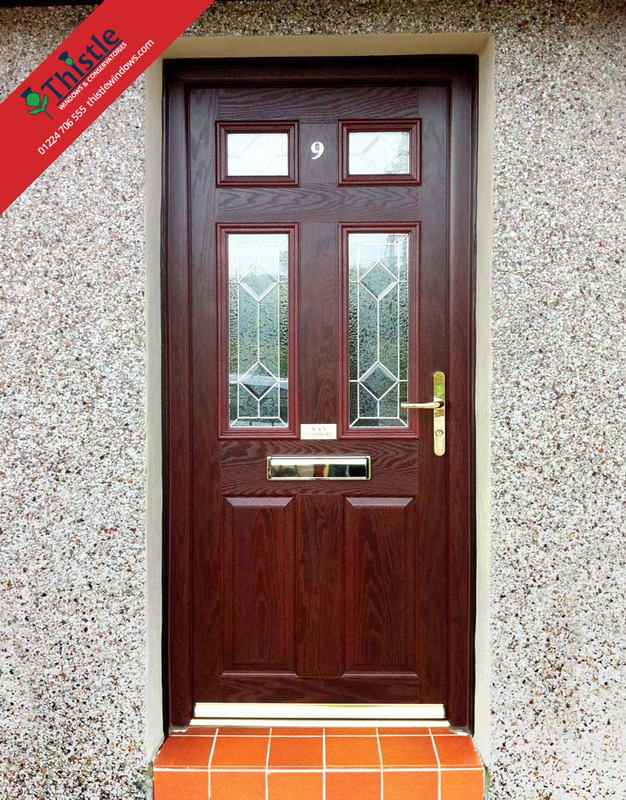 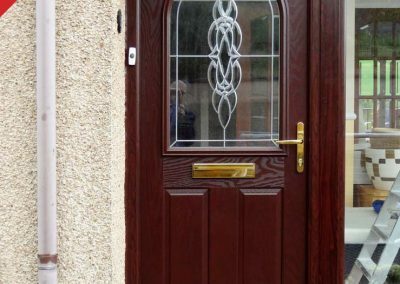 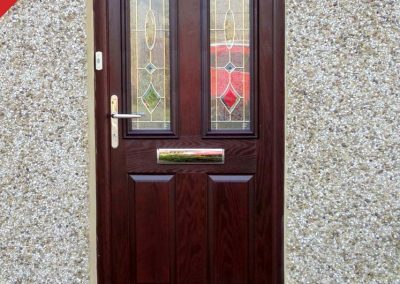 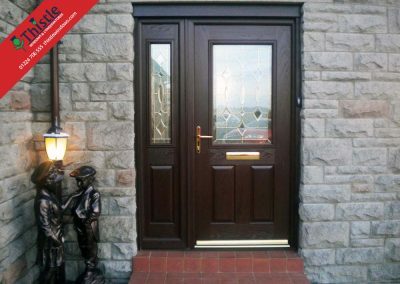 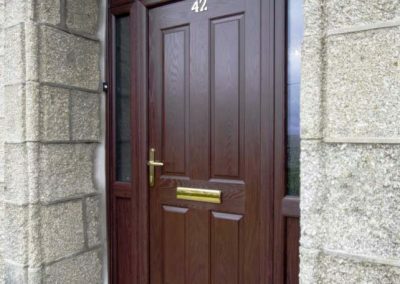 Are Composite Doors suitable as Front Doors or Back Doors? 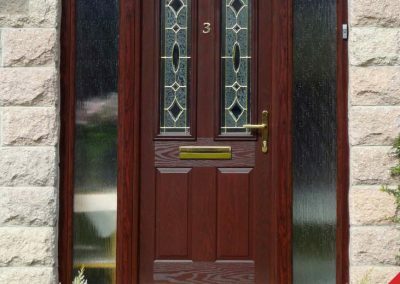 Will a Composite Door protect my home against the elements? 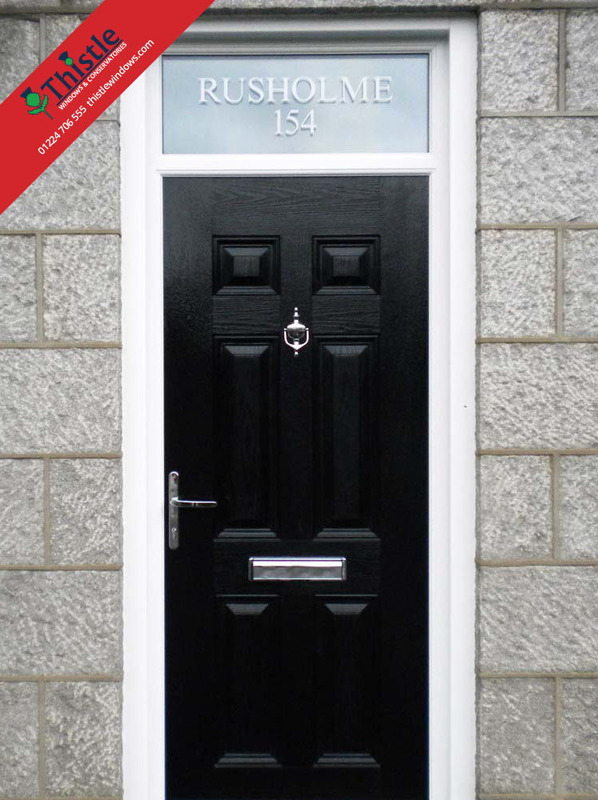 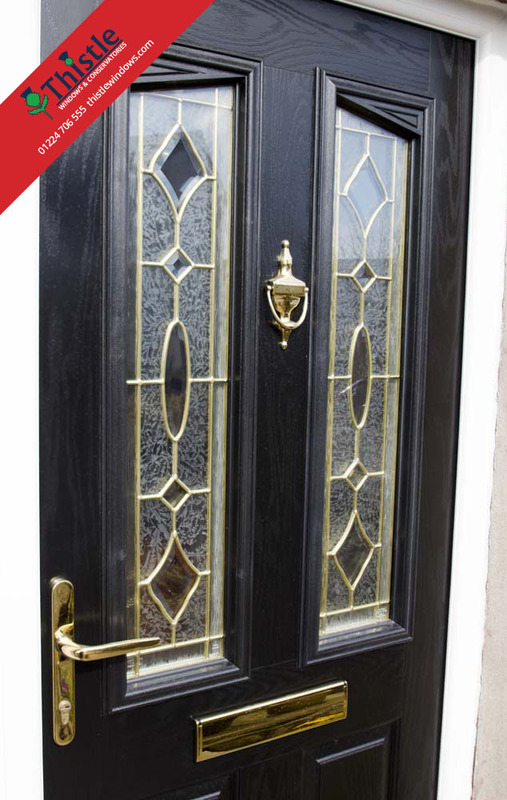 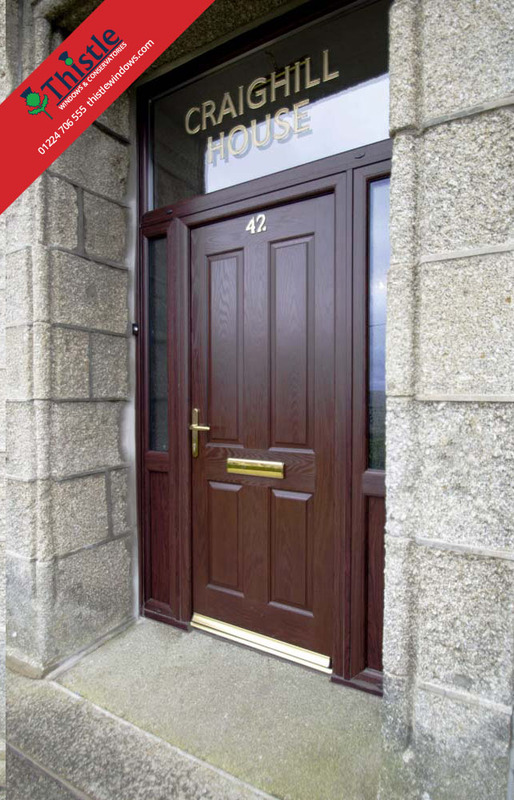 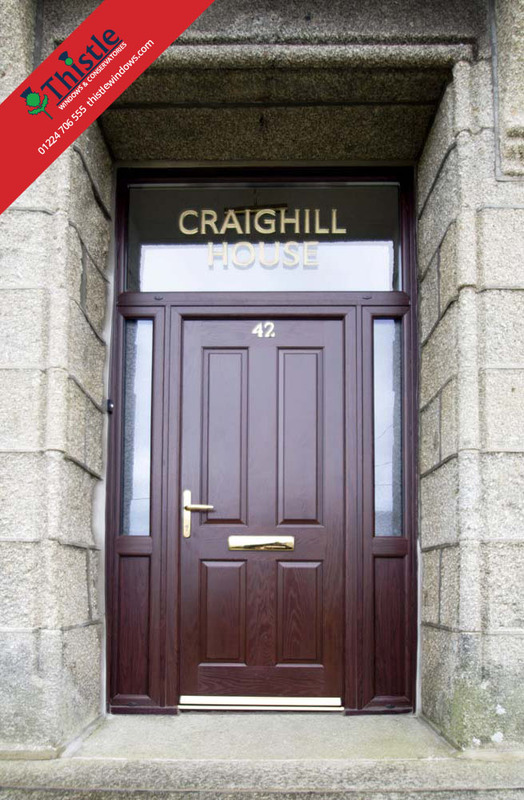 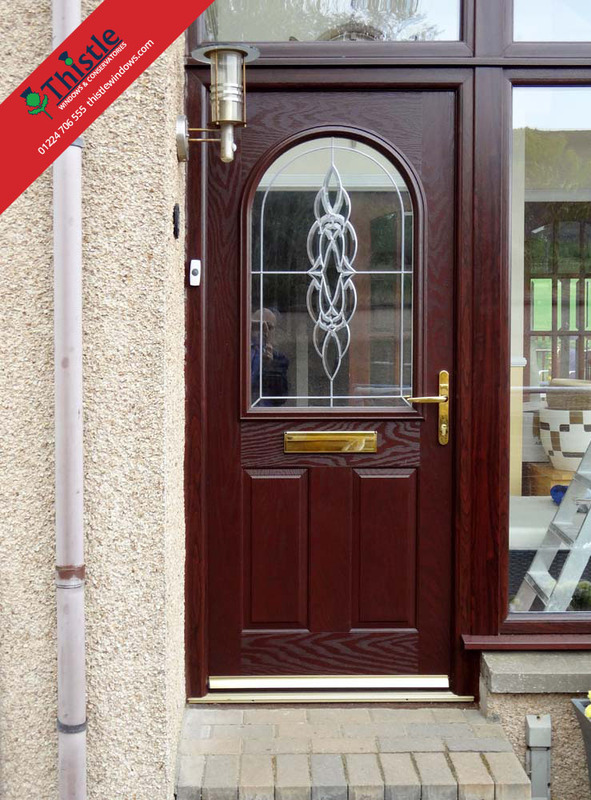 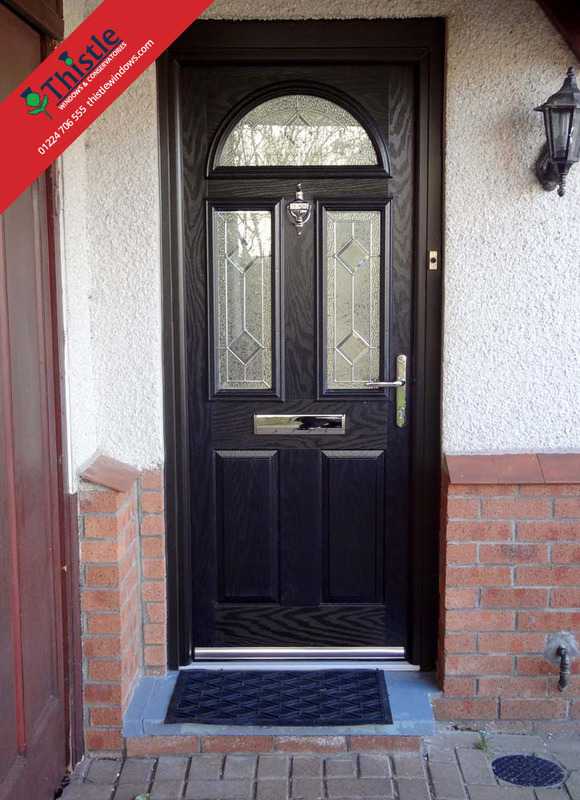 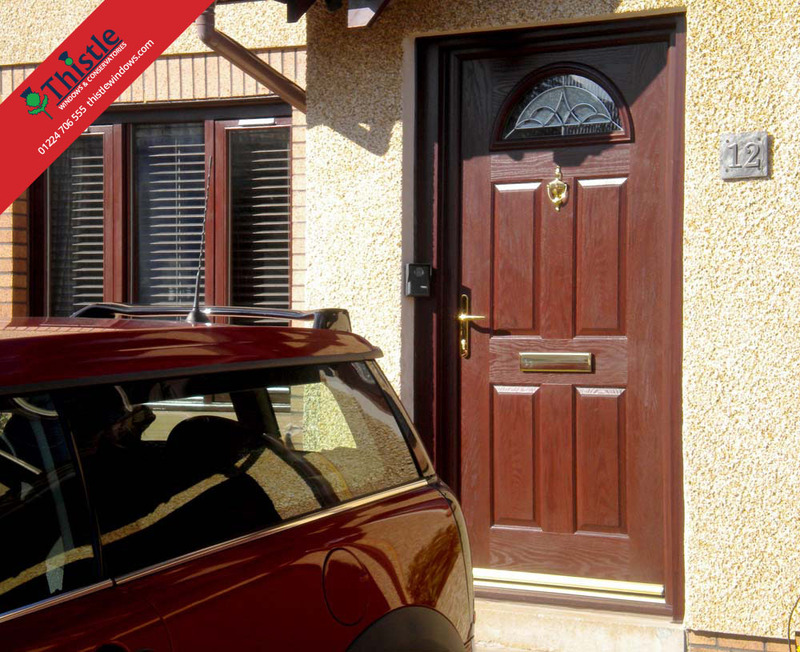 Are side panels available for Thistle Composite Doors? 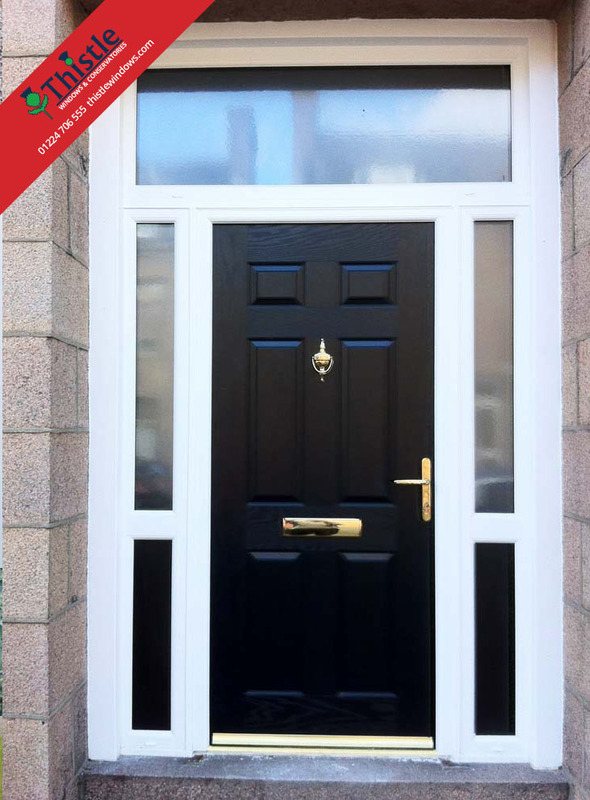 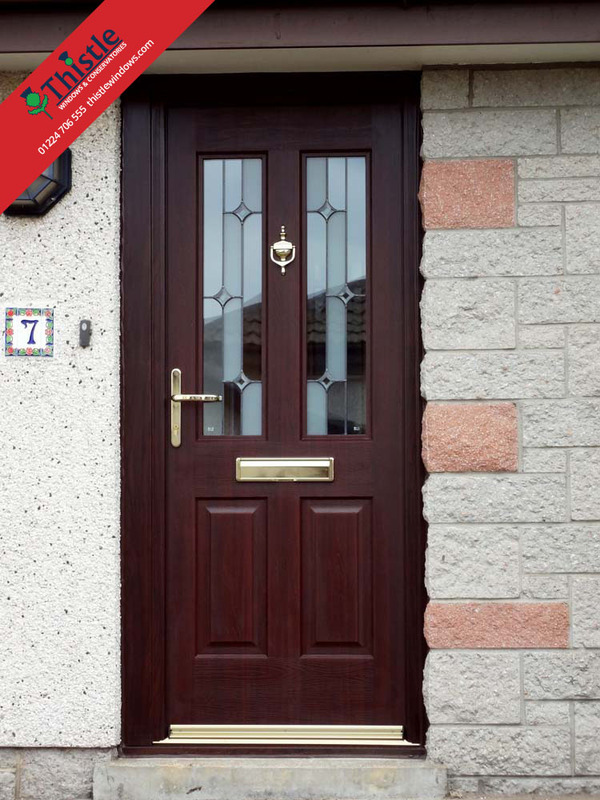 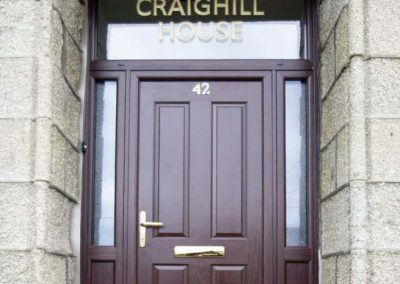 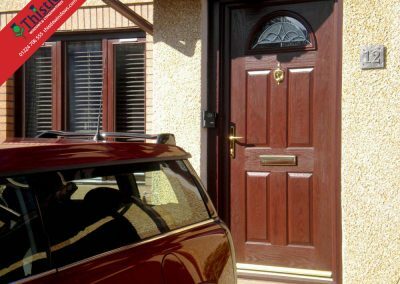 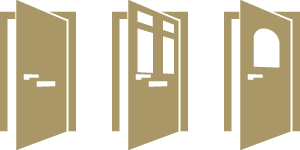 What is the guarantee on a Thistle Composite Door? 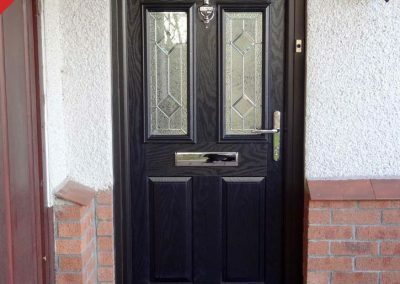 A composite is something made up from several elements and this is also true of a Composite Door – it is made up of a timber sub-frame which is filled with high density foam. 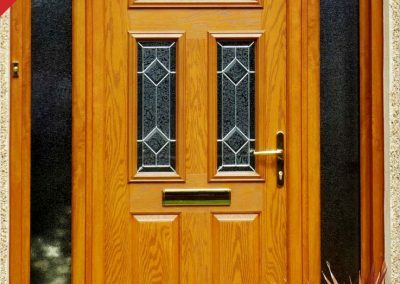 The surface of the door is coated with Glass Reinforced Polymer for a durable yet beautiful appearance and features a grained effect. 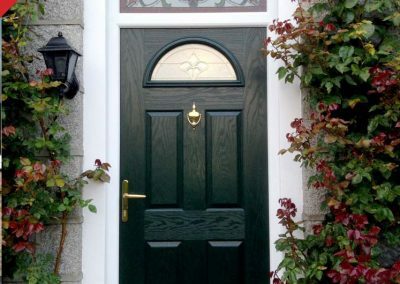 Composite Doors offer all the aesthetic benefits of painted or varnished timber, combined with the security, performance, low maintenance and long life expectancy of modern materials. 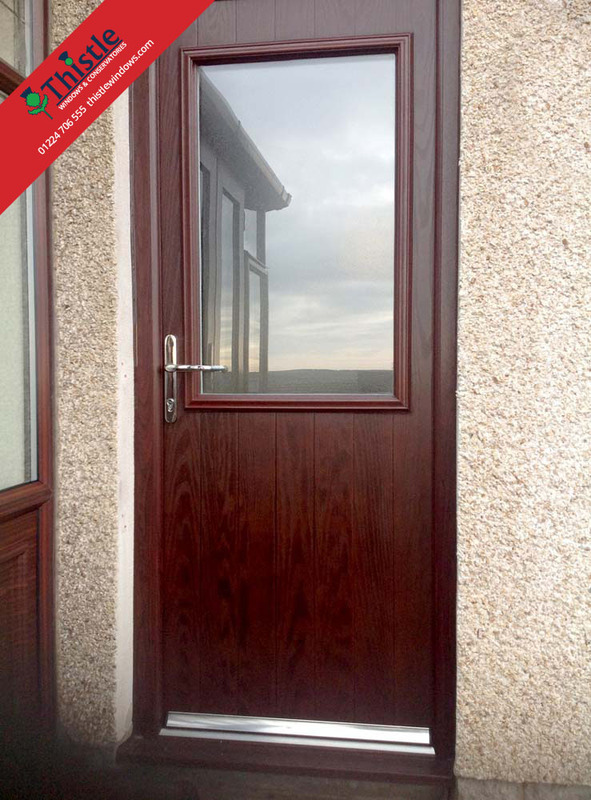 No warping or twisting over time and no painting, staining or varnishing needed! 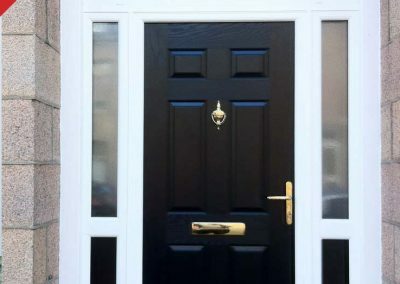 VEKA Composite Doors from Thistle Windows & Conservatories might look beautifully welcoming but they also provide a formidable barrier against any would-be intruders. 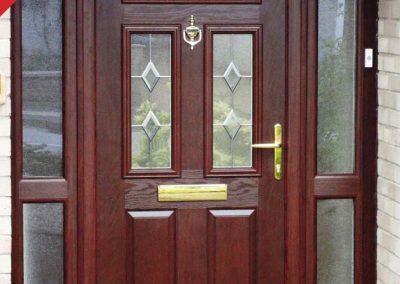 Every style of VEKA Composite Door we offer is approved by the Police led initiative Secured By Design. 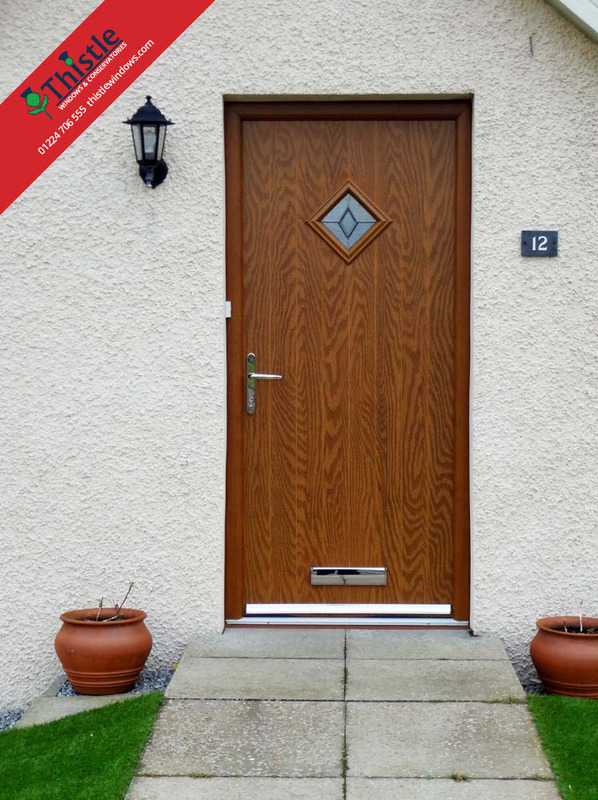 This accreditation is awarded only to those products which pass the stringent tests of the scheme, which was established by the Association of Chief Police Officers in order to promote home improvement products which meet the principles of ‘designing out crime’. 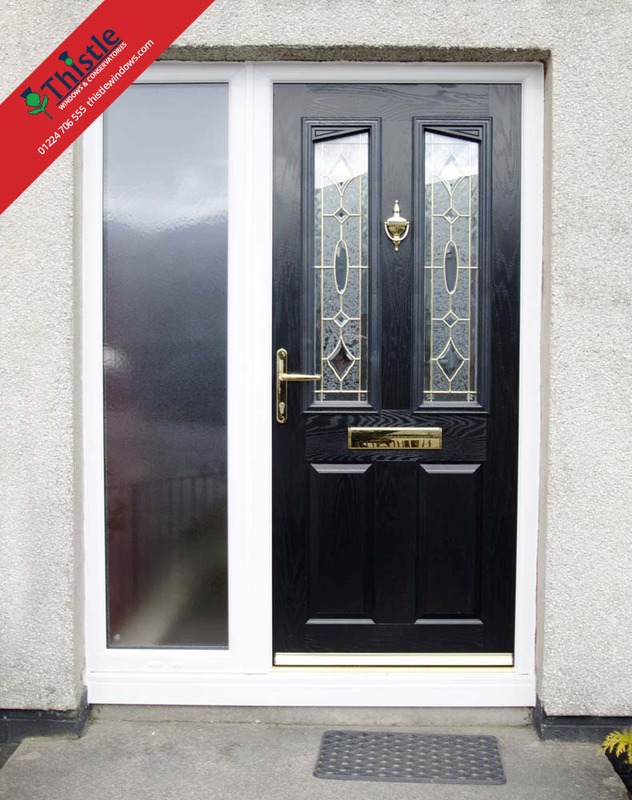 In addition, you will find Ultion™ Sold Secure Diamond Locks fitted as standard on all of our Composite Doors. 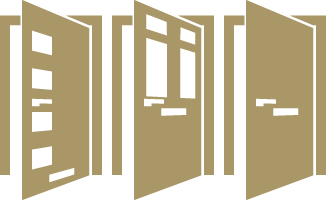 Ultion locks have been drill, pick, bump and snap tested and have received Diamond Certification from the Master Locksmith Association. 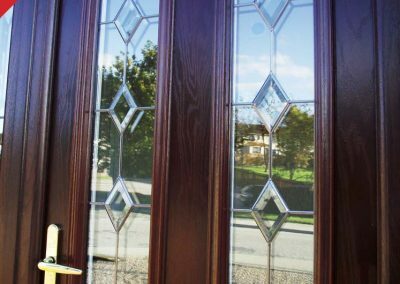 Ultion locks are still snap secure even if a key is present in the inside of the lock, making them one of the most secure lock systems on the market today. 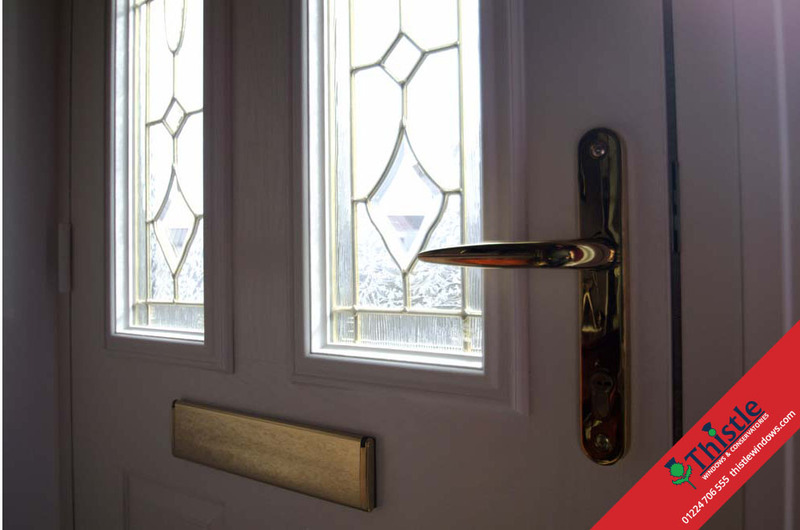 To find out more about how our Ultion™ Sold Secure Diamond Locks ensure your door is of the highest security, please CLICK HERE. 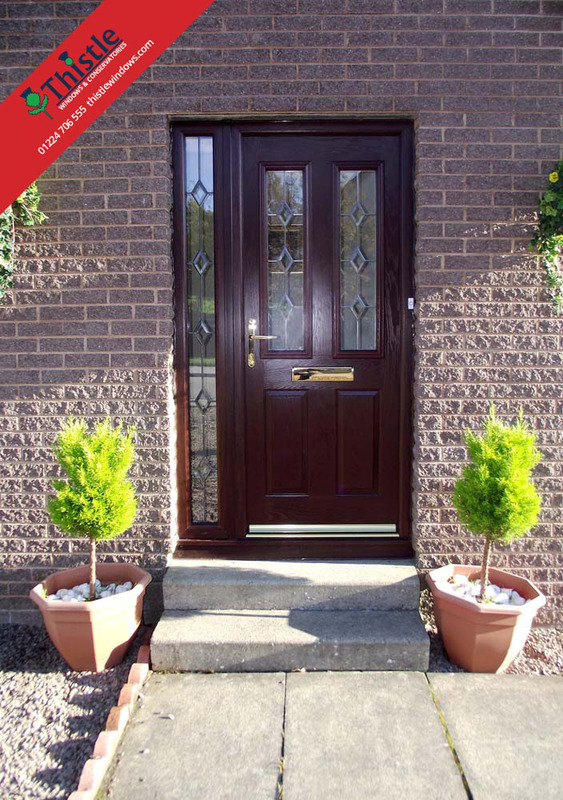 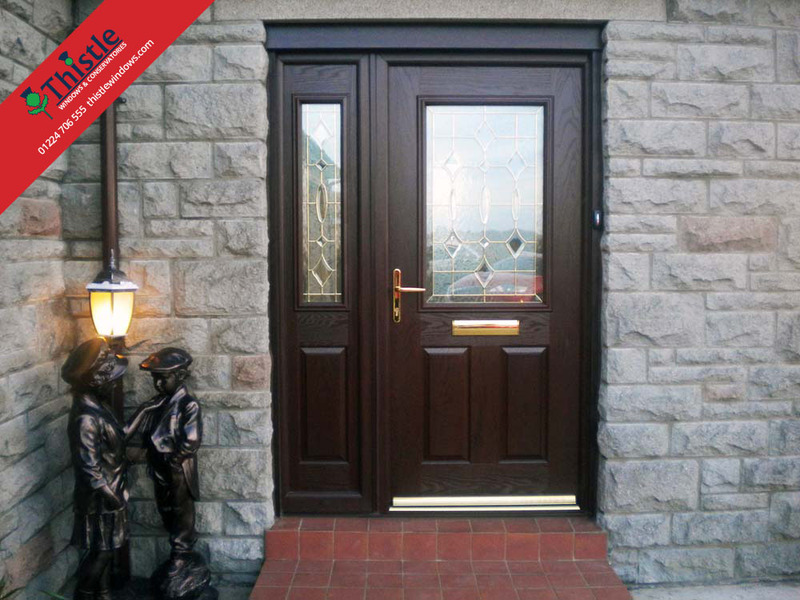 Our VEKA Composite Doors can be fitted as either front or back doors – the choice is yours. 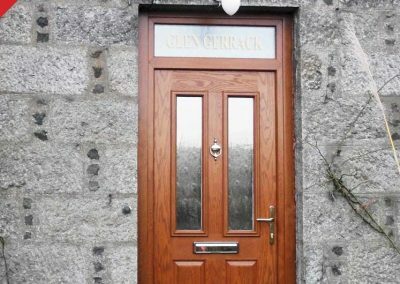 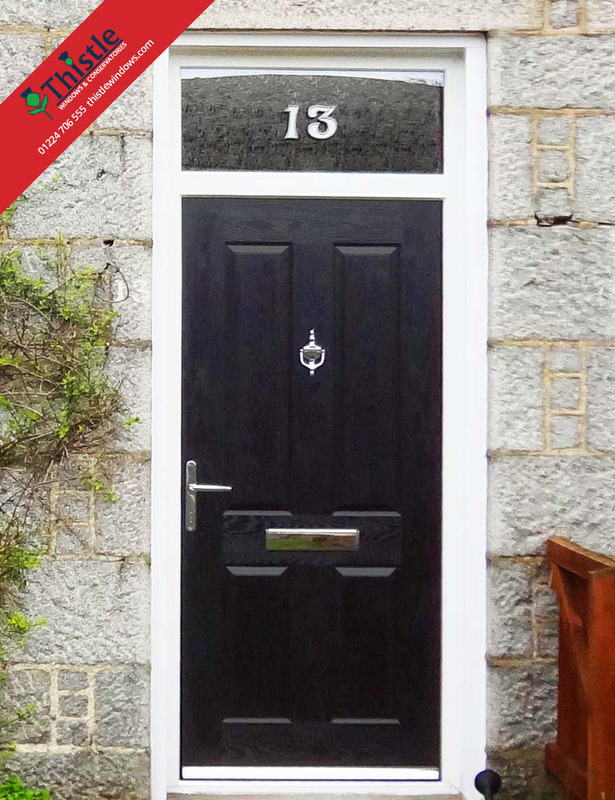 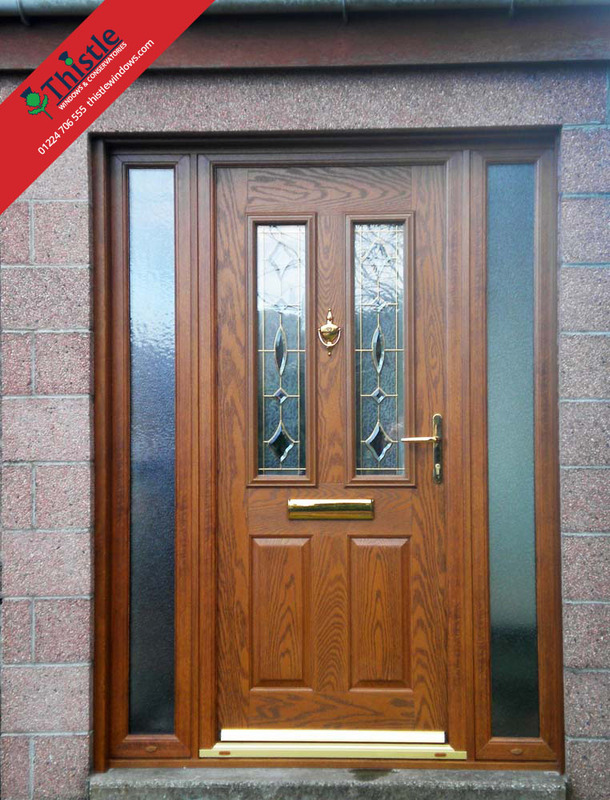 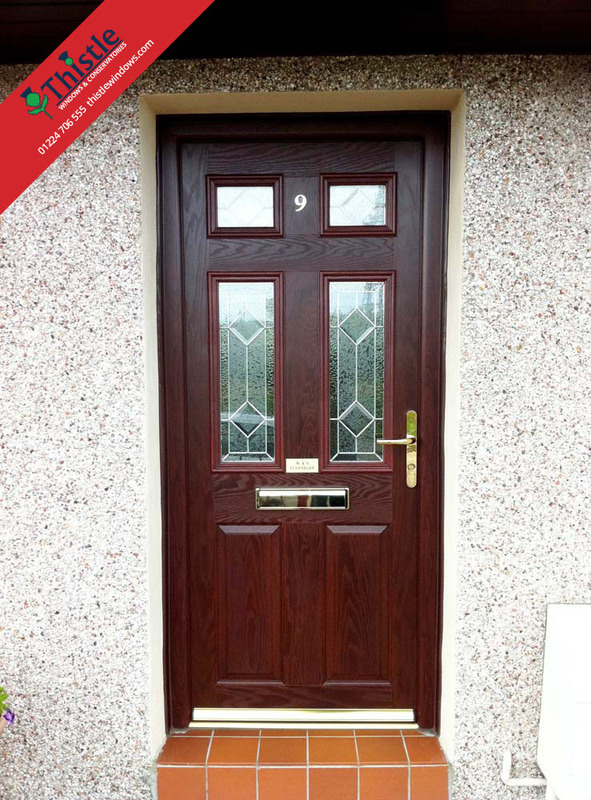 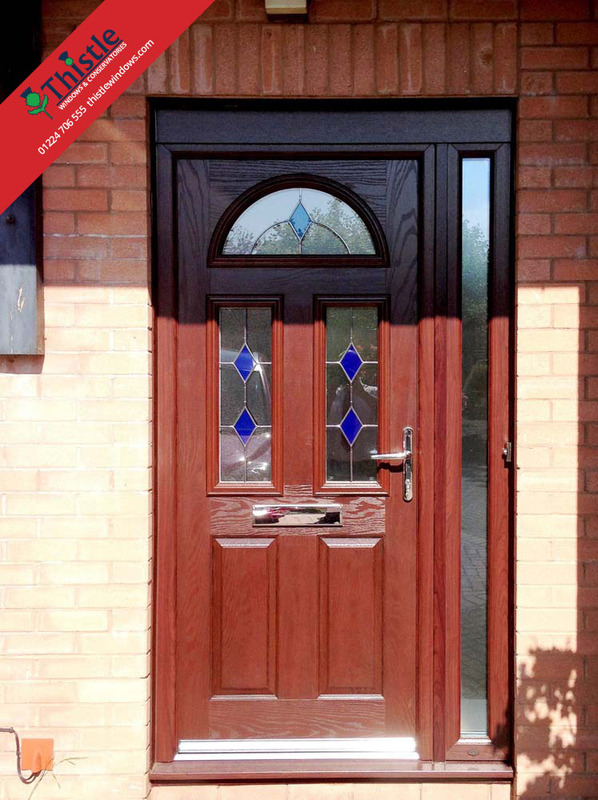 Some of the ones with large glazed areas can also look stunning as doors within the home or on an entrance porch. 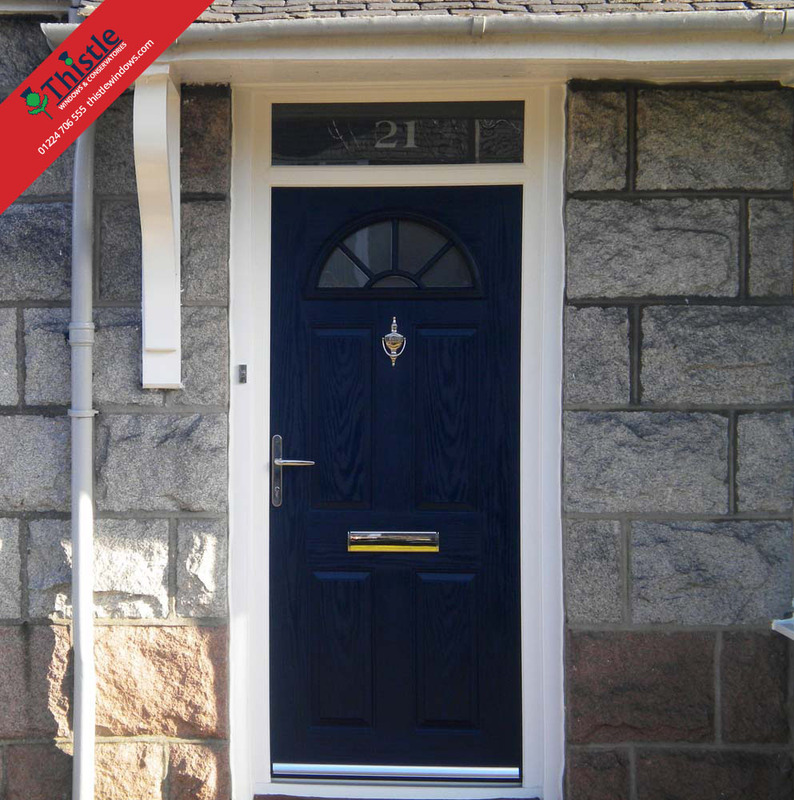 Certain styles are more suited to being fitted as a front door, and some are more suited to being used as a back door – the team at Thistle Windows & Conservatories will be happy to guide you through the options to find the best fit for your home. 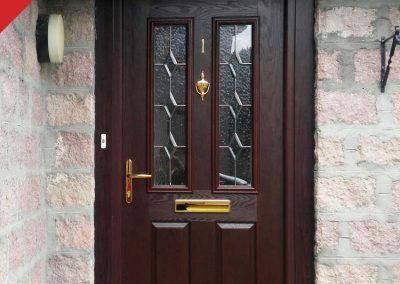 Absolutely – all of our VEKA Composite Doors have been tested to the very highest standards to protect your home against the worst of the elements. 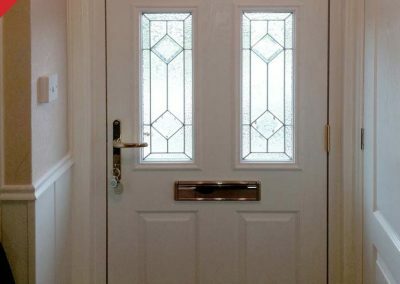 Rain deflectors are also fitted to every door, to divert any rain running down the surface of your front door away from your home. 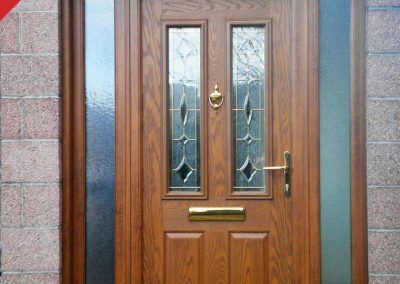 Yes – if your home currently features side panel/s next to your front door, or if you would like to add them, this is absolutely no problem. 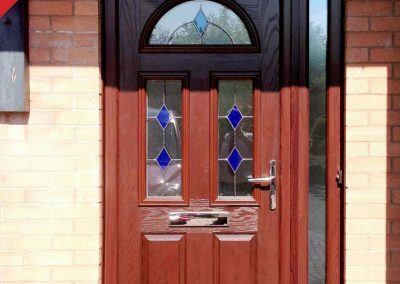 You can select from either glazed sidelights and toplights to match your chosen glass design or matching side panels that perfectly complement your door. 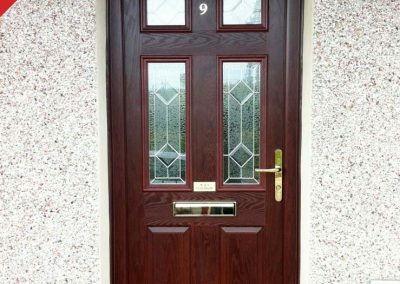 From the slab, frame, glass, handles, hardware and mechanism to the actual installation itself – every Thistle Composite Door is protected with a comprehensive 10 Year Thistle Windows & Conservatories Guarantee. 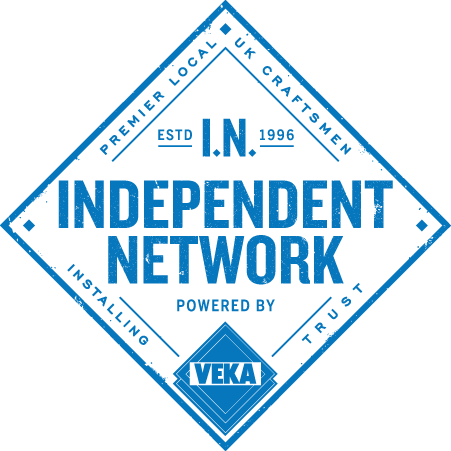 Additionally, for complete peace of mind, all of our Composite Doors are also covered by an independent 10-Year Insurance Backed Guarantee, provided by national industry standards organisation Network VEKA (CLICK HERE to find out more). 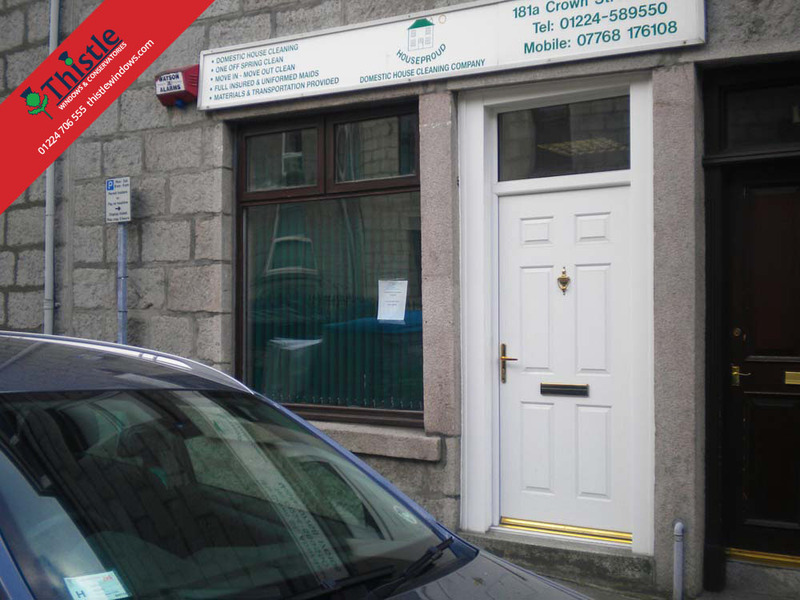 Furthermore, we understand that flexibility is a key part of any funding decision. 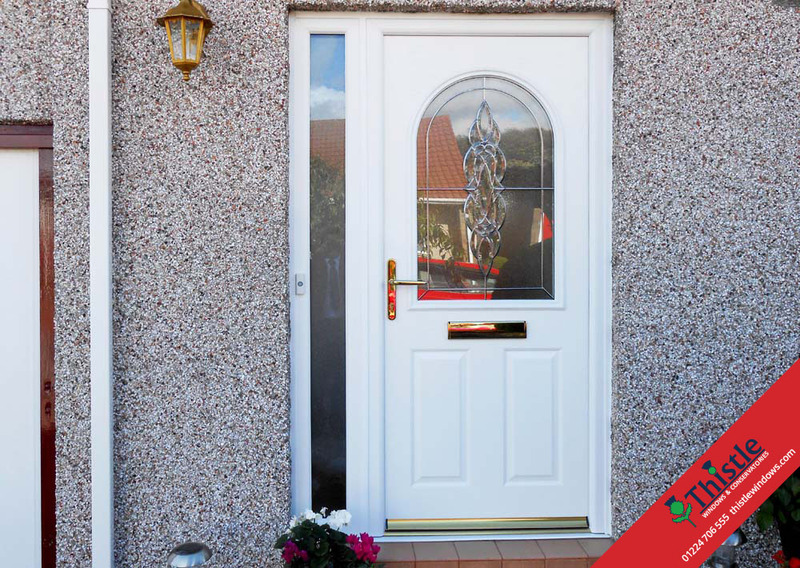 Ultimately, we’ll make sure that with whatever funding option you choose – you’ll get peace of mind! 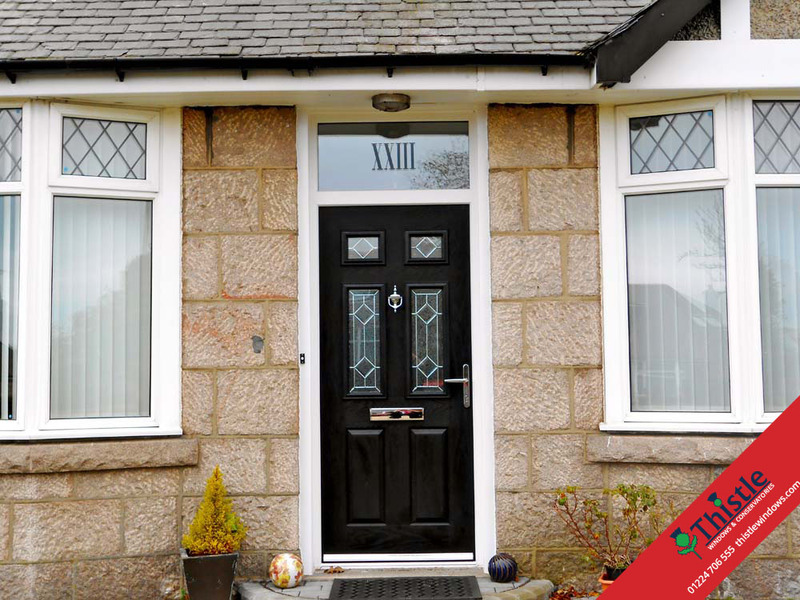 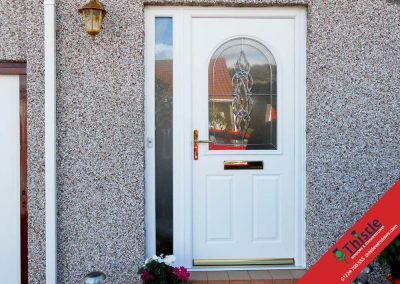 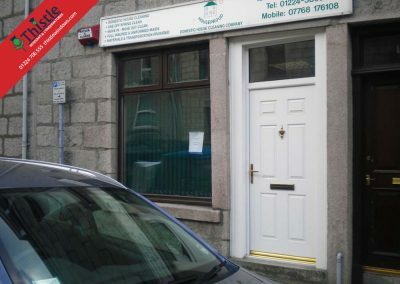 That means we don’t cold call and we don’t knock on doors – our customers choose us based on the strong reputation we’ve built serving North East Scotland since 1995. 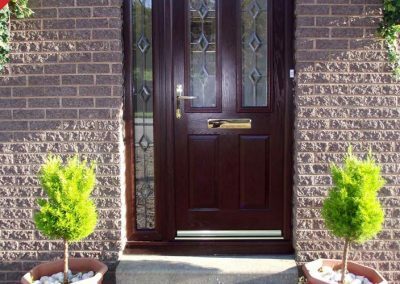 In short, we’ll provide you with the high level of care and attention that you expect from a local company, from quotation through to installation – and beyond.